Should everyone have a Ransom Rest? After reading one of the articles suggested on this forum about having accurate equipment to gauge progress in learning to shoot accurately and the following article, I wonder if every serious bullseye shooter should have a Ransom Rest or at least access to one. Re: Should everyone have a Ransom Rest? If I didn't have access to one I'd probably buy one. BUT resting on a bag will get in the ballpark. I thought the referenced article was interesting in that there were subtle but nevertheless differences in the groups based on small powder changes. I doubt resting on a bag would bring out these changes. It takes almost as much practice with a Ransom Rest to get repeatable results as it does shooting expert bullseye scores--they are expensive and difficult to operate properly unless you are using it a couple times a week or more. You will be able to do ammo development from a sandbag--instead of a ransom 2" group, you will be comparing a size "y" group to a size "z" group and shooting more groups to confirm your results. I recommend more trigger time instead of Ransom Rest. Thanks for slowing me down Rob. I knew it was coming but sometimes the mind works a little ahead of what's practical. More trigger time it is for me. Operating a Ransom Rest is a science in and of itself. If you don't have a few yards of concrete planted in the ground you're going to have some interesting "results". The replication of your "shot process" with a RR is even more critical that when you're shooting. With all of that said I personally do not have a lot of faith in a RR to tell if something is "accurate". The RR is incapable of holding a pistol as a human does, and vice versa, a human is incapable of holding a pistol as the RR does. In my opinion it is a reference point, not the absolute last word as to whether your pistol is still shooting accurately. A RR is great if you have no idea as to your guns accuracy, but you can find that out pretty close by just using sand bags off a rest. once you know the gun is accurate, you can test loads but there have been so many of us that have done it and the results are posted all over the net and here that there is no real reason to buy one imo. If you have a match grade gun and barrel then the accurate loading info will probably shoot good for you as it does for countless others. Sandbagging guns helps you learn the trigger of the weapon which the RR can't do. If you are consistent and disciplined, sandbag shooting will indicate how accurate your weapon can be if fired properly freehand. I always sandbag my pistols for accuracy and initial sight-in before tweaking while doing freehand practice. You need to keep in mind the purpose of a Ransom Rest. It is to remove as many human variables from the process as is possible. I use my RR for load development. That is a separate process from my shooting. It is very true that there are techniques that must be employed to produce the best groups, but the results will show the capabilities of that particular gun and that particular load relative to that particular testing process employed. For example, if you shoot a 10-shot group by loading two 5-shot mags, and let the gun go to slide-lock after the last shot in the first mag, your next shot will likely be one of your outer-most shots. Adjust this process by changing mags after your 4th shot, preventing slide-lock, and the group will probably be tighter overall, as you have reduced variability in the process. I personnaly started employing this technique to my slow fire strings after seeing this cause and effect illustrated. Shooting is a quantitative process which is the sum of all the variability. Reduce any variability, and you generally inprove the quantitative results. All the RR does is allow you to evaluate the gun/load combination while having removed the majority of the human variability. Regardless of how I shoot it, the RR allows me to determine what load shoots the most accurrately from my gun. Once I pick it up to shoot, that group is going to increase in size, because I am now adding variability to the process. My grip, my wobble, my eyes... all group enlarging variables the RR isn't affected by. A RR doesn't make you a better shooter in any way, but used correctly, it can allow you to know you are shooting an ammo load that has reduced as much variability from the gun/ammo shooting process as possible. This is important because when you shoot this gun/ammo off hand, you now have a gun/ammo/human shooter process. The sum of all this gun/ammo/human shooter process variability is the group you shoot. By having developed that load with a RR, you can now feel confident that the increase in group size from what the gun/ammo did on the RR is due to you. Now we're talking trigger time and technique practice or adjustment. Now, don't get me wrong... you can do the exact same testing/load development from sandbags. However, you are doing so with a reset dependant upon your eyes, and a base that is surely more unstable than a clamped RR. I know I have been amazed at the difference between groups I shoot off a hand rest as compared to off the RR, for the same gun/ammo. To someone with really good eyes, this may be an insignificant difference, but to me it was significant. The other thing to think about is once you have the load you want, until you change something, you no longer need the RR. Mine goes unused for long periods of time. I think of myself as both a shooter, and a handloader. In my opinion, the RR is helpful helpful to the shooter, and invaluable to the handloader. And before you ask... the answer is handloader. Given the group sizes I've been able to get with my Les Baer wadgun and loads I've worked up, and the fact that I'm stuck at the upper end of Sharpshooter, I think I'm definately a better handloader than shooter. BUT... I'm working on it, and that's where the fun is! Terrific post Chuck26287! Everything you wrote makes perfect sense. I think it parallels what is shown in the link that I included at the top of this thread. It's amazing the difference a small amount of powder can make. I think a Ransom Rest is a very useful tool to sort out .22 ammo and centerfire ammo. In this day of hard to come by .22 ammo and reloading components, I would think the RR would be extremely helpful. That being said, I think the RR is most useful to someone who is invested in the game, i.e. expert or above. BE Mike wrote: I think a Ransom Rest is a very useful tool to sort out .22 ammo and centerfire ammo. In this day of hard to come by .22 ammo and reloading components, I would think the RR would be extremely helpful. That being said, I think the RR is most useful to someone who is invested in the game, i.e. expert or above. I'm curious... why do you feel a RR would be most useful to an Expert or above shooter? Are you referring to a use different from what I outlined (load development for optimum accurracy in a given gun)? Sorting out .22 is sort of the same thing, as you'd be looking for the brand or lot that shoots best in a given gun (again, smallest group size being the desired or tested for characteristic). I don't ask to be argumentative, but I see the benefit as purely quantitative (the group size measurement), and the benefit or improvement gained from the RR absolutely equal to any shooter. To illustrate, if you have a Marksman who has an 8" arc of movement (aom), and he shoots with a gun/ammo combo that produces a 4" group (shown in the RR), on average, and excluding non-normal jerks and flyers, the maximum group size this Marksman will produce is a 12" group. If a Hi-Master with a 0.75" aom shoots this same gun/ammo combo, his largest group would typically be 4.75". Now, take that gun/ammo combo and further test it in the RR, and tune the load so that the gun ammo combo now produces a 1.5" group. Making the same Marksman to Hi-Master comparison with both shooting this RR improved gun/ammo combo, the Marksman's new max group size is 9.5", and the Hi-Master's group is now maxed at 2.25". The RR testing, and subsequent improvement to the gun/ammo combo allowed both the Marksman and the Hi-Master to reduce their group size by the same 2.5". This is why I've always felt it didn't matter how badly I shoot, if I improve my gun/ammo combo through testing and load adjustment, I will improve my shooting results overall. The RR testing provides exactly the same improvement for the Marksman as the Hi-Master. Now, once you get your best group possible with the gun/ammo, the only place left to get any more improvement is the shooter. I agree with Chuck--I'm betting that most High Expert-High Master shooters don't bother farting around with the Ransom Rest. Their arm already is one. Rob Kovach wrote: I agree with Chuck--I'm betting that most High Expert-High Master shooters don't bother farting around with the Ransom Rest. Their arm already is one. I don't think that's what Chuck is suggesting. But rather the RR removes the variability of the shooter in order to develop the optimum gun/ammo combination. In other words, everyone could benefit from using one. Oh, and that's why he says I should have one too. Actually, I was very careful not to say I felt everyone should have one. I certainly don't feel a RR is something that should be on the standard list of Bullseye gear. However, I was trying to convinvce anyone reading that everyone could benefit from one, and the level of a shooter's skill was irrelevent to the benefit that could be realized from its use. I even admitted that the same thing could be done off sandbags, as others mentioned, but did so while pointing out that it would not be to quite the accurracy degree of a RR. It comes down to the gain being worth the expense, where the gain is smaller group size, and the expense is the RR cost, learning curve, and time expediture of RR testing. To most, probably not worth it. To others, maybe worth it initially, but as they get confident in their loads, less worth the time. To some, like me, I enjoy the hobby of handloading, and it's one way to measure the successfulness of my loading. Plus, it helps my scores. But, note I said it helps my scores, NOT my shooting. 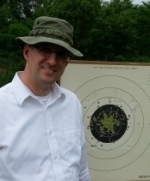 Only practice and shot process refinement and consistancy improves my shooting. A RR is just a top of the line tool. If you don't want to do the job, you don't need the tool. If you don't want all the expense, there are cheaper tools. I will say I'd be VERY surprised if there are any Master or Hi-Master shooters using guns that haven't been in a RR at some point in their life, even if just to verify the accuracy of the build by the gunsmith that put their name on it. That should testify to something about the RR. My point is, if a Master or HM shooter drills a sub 2" group out of his hand, I'm betting they aren't going to go through the hassle of getting the ransom rest out. An HM shooter has the ability to shoot groups that are just as good as the Ransom can do. Heck, I'm the "go-to" guy at my club to shoot a tight slowfire group for guns that we don't have adapters for, and I just shoot like it was a slowfire string....and it's not like I'm an HM shooter--the people I'm doing the testing for just need that extra reminder that their equipment and ammo is good enough to not hold them back. When I shoot a 95 slowfire for them, that is all the testing that they need. By the time you reach expert or higher, you pretty much know what works and what doesn't. As to 22 ammo, 99% of it will shoot x ring out of a accurate gun so a waste of time unless your testing a unknown or new brand. If ransomed hundreds of loads and can tell you some of the most accurate in a rest is not what you want to shoot, they either have to much recoil or other characteristic's that don't feel as good to the shooter as other loads that are just as accurate.